This post isn't my best in photography, and I debated even writing anything at all about it since it was such a simple little day trip that we took. But I decided I'd at least put a little something out there on Bishop Peak since it ended up being a pretty cool crag. I took all the photos with the new go-pro I got, and so I don't have that many photos because I was playing around with the video. I'd like to start creating video shorts to go along with some of my bigger trips and so I was test driving the thing so to speak here at Bishop Peak. Here is the link to my Bishop Peak video on youtube. Bear with me as I am extremely new to movie editing and often impatient. Michael and I decided to take a day trip up to Bishop Peak to check out the climbing there. It's only about a 2 hour drive from Bakersfield, so made for an easy trip. Is this go-pro thing on? We came highly unprepared because there wasn't much as far as route description on mountain project as we had hoped. Fortunately for us, we ran into some kind locals that sent us a pdf of the climbing area. and we settled down at this spot called Cracked Wall. 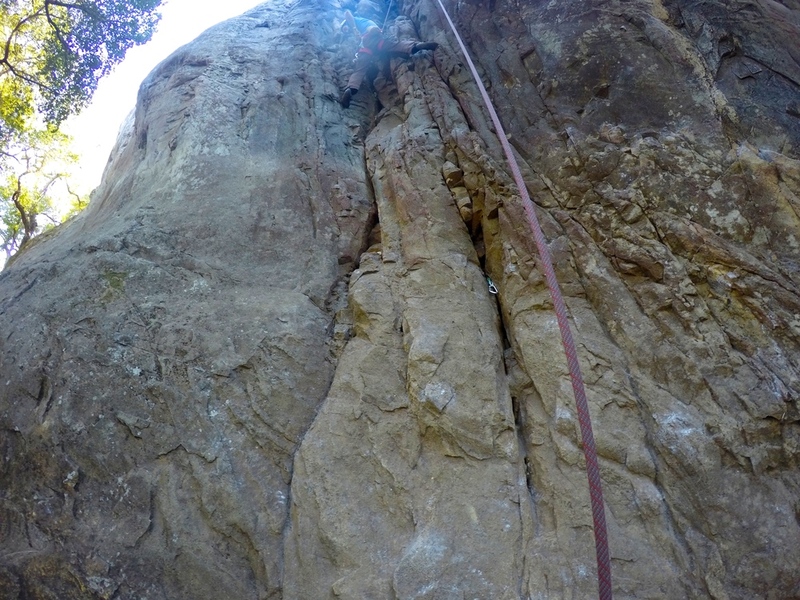 We didn't work on a huge volume of problems, but instead climbed an easy 5.7 "crack" called Sixty Seconds Over Soledad a bunch of times practicing trad gear placements. Michael also worked on 2 5.11s, Western Airlines (5.11b) and Only Way to Fly (direct finish) (5.11a). I jumped on the 5.11a but it was tricky for me... a bit overhung, and I couldn't seem to pull the move. Nothing monumental about the day except that we decided we liked the place and will probably find our way back here sometime. Theres a cool sounding multi pitch on Bishop Peak that looks interesting. Here's that 5.7 "crack". Stemming and mantling are your friends. Hopefully I can do this place more justice with a better post someday. Until then.. my 2 cents on Bishop Peak are above. Cool little place, Cracked Wall only scratches the surface of what is there. I haven't been keeping up very well on posting on my weekends. Partly because I've been messing around too much with this video stuff. I will be getting some more time off here soon, and I'm thinking of switching my blog to SquareSpace. Until Then, I'll try to keep up as best I can.